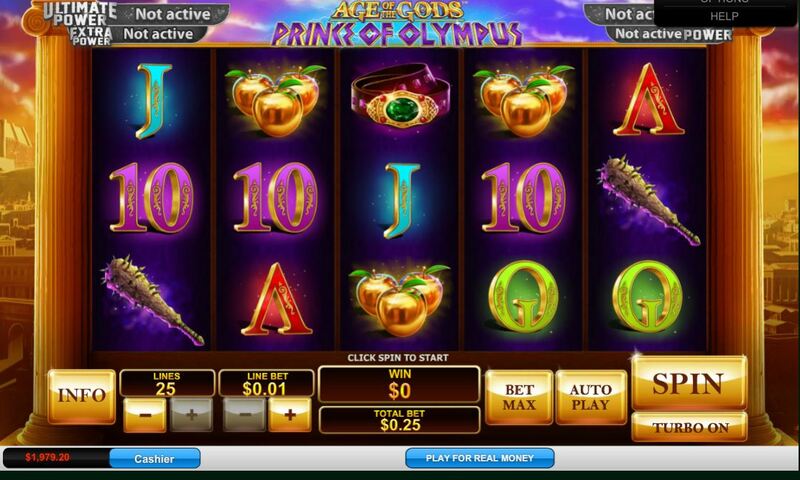 Age of The Gods - Prince of Olympus slot is quite literally the son of the father! This game has the mighty Hercules as the God who just happens to be son of Zeus who was the theme in Playtech's Age of The Gods - King of Olympus game, another of this series. These games replace the old Marvel slots and this time we get some improvement on the graphics as the reels are set in a temple against a spectacular backdrop of this ancient city. Some epic music rolls occur when the reels stop and we get the horses hooves galloping as they spin and the Ultimate Power Progressives are incorporated too. But will improving your balance on this game prove to be a Herculean task? Like the the Zeus version we get 5 reels of 3 rows each and the same 25 pay lines. This game however is the replacement for Marvel slot Hulk (25-Line) so we have some major differences. If we begin with the pays the best is 5-of-a-kind of the Fire Hounds at 160x bet, followed by the other picture icons of Golden Apples 20x and Club and Belt both pay 8x bet for the 5. Six card values pay 2, 3 or 4x and like the picture icons none appear stacked. The Golden Hercules Wilds only appear on the centre 3 reels but have some benefits of their own. If you get one of the centre of reel 3 it expands and you get 2 re-spins with it held in place, but this is nowhere near as rewarding as if you get all 3 anywhere in view as they will all expand for one re-spin with a giant 3x3 Wild in the centre! If this happens and you get a Fire Hound icon on the same row either end you could get over 1000x bet for the multiple 5-of-a-kind wins too. The multi-headed mythical snake Hydra may appear on reels 1 and 5 which immediately calls Hercules into battle. He will fire arrows where you choose at various heads for cash awards and if he can slash Hydra with his sword you get a multiplier for all wins accumulated too. Don't worry if he's not winning the battle as he can randomly go into 'rage mode' and destroy all Hydra's heads at once for the best prize! Three Red Hercules scatters anywhere in view will trigger 10 free games which are all paid at 3x multiplier and you can still trigger the Wild features described above, but not the Hyrda one. You can retrigger them and if you remember I stated the block Wild can potentially pay over 1000x bet with the best symbols either end of it? Now you could triple that.